This piece was in a group show titled, simply, 2D, at the Project Lodge in Madison. 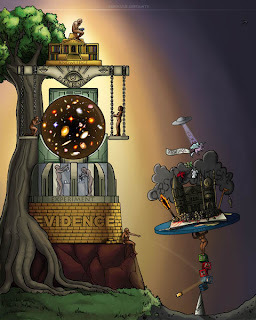 It is an illustration that dramatizes the scientific method and its superiority to irrational methods of understanding the world. 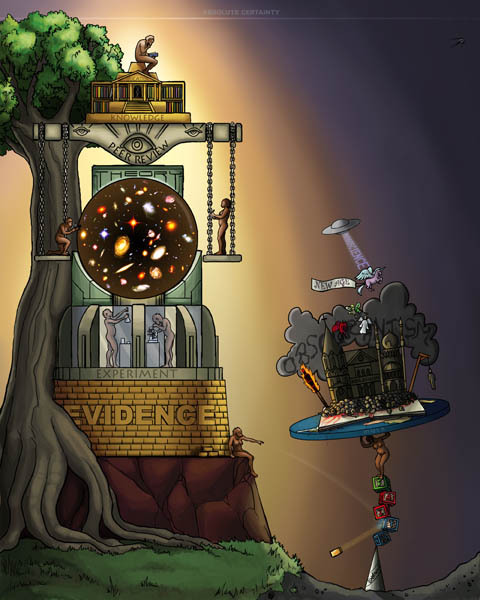 Unlike mathematics and logic, the natural sciences build theories around facts and evidence; they cannot and do not attempt to prove assertions with 100% accuracy. Hence, “absolute certainty” hovers above both towers and beyond the scope of the natural sciences.